Let me start with saying I made this cake from a gluten free cookbook, but it is not just for people who are gluten intolerant it is for everyone. 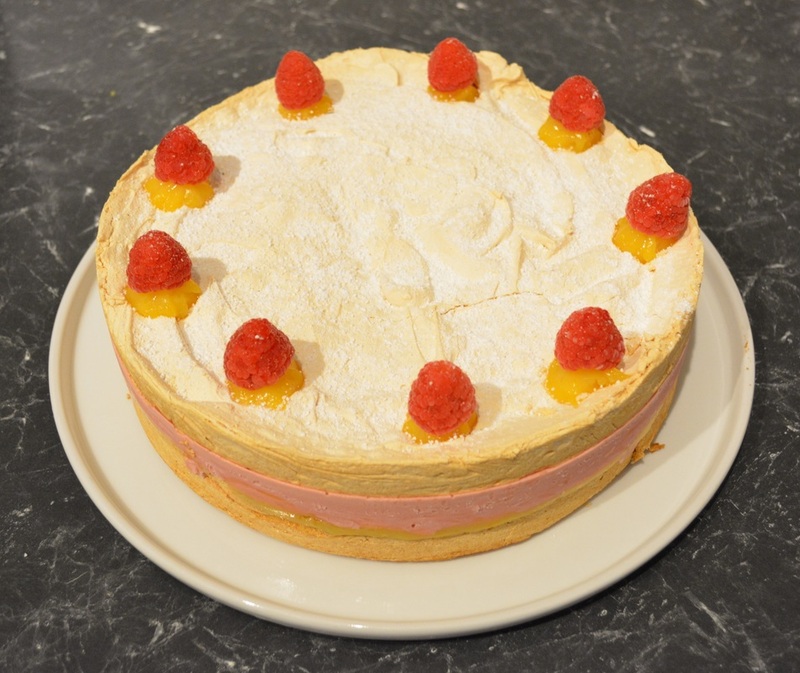 It is basically a meringue filled with an amazing raspberry mousse that is slightly frozen and an orange jelly. All ingredients are what you will find in your pantry, nothing special, except the fruit that is. Now I have been wanting to make this for a really long time, but was waiting for the right time. My dear cousin was coming over who is gluten intolerant. I have in the past tried gluten free cakes and I have to say they weren't that great. So I decided meringues were the way to go. 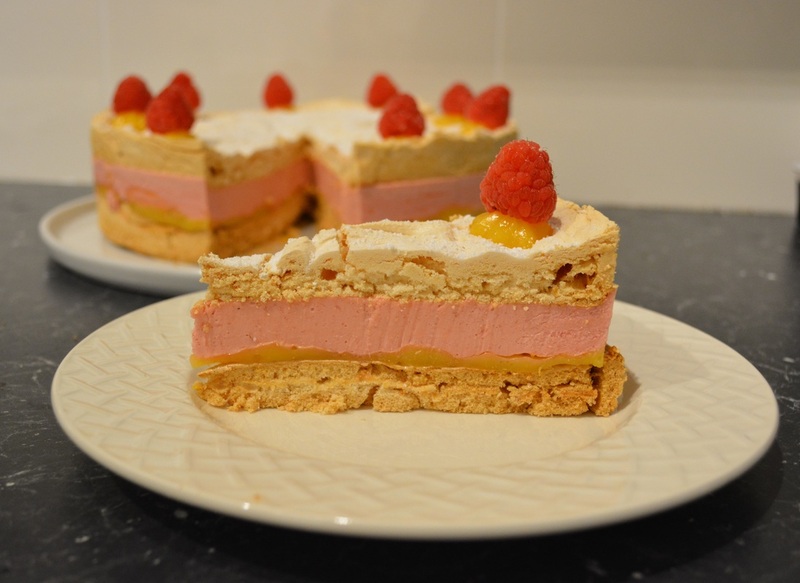 The meringue is filled with the most delicious fresh flavour combination of raspberries and orange. It was light, it was flavoursome, it was brilliant. 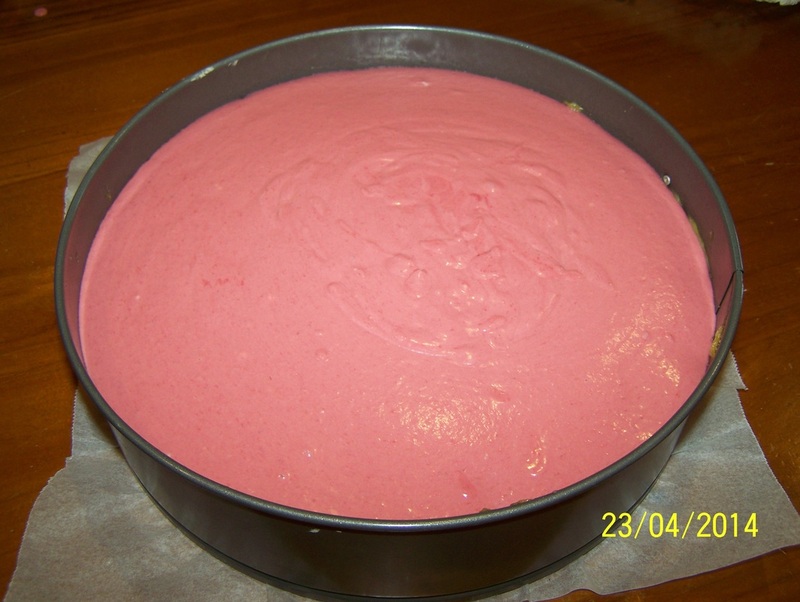 The raspberry mousse just freezes and makes the most delicious ice cream like mousse, it really is special. Now I will suggest not making this when raspberries are not in season. It is seriously an expensive cake when they are not in season. When I get a chance I will try it with frozen raspberries, see if it is just as good. Also by doing it when raspberries are in season, it is just perfect to have in the summer as it is so refreshing, so the taste of summer. Was it difficult, not really, you just had to follow the steps and time it well. The meringues I made the night before. The jelly and mousse I made in the morning. As I have a fan forced oven I may have overcooked ever so slightly the meringues, next time I would reduce the oven temperature, but this is seriously a minor issue. If slightly overcooked you just get a crisper meringue which is okay, so don't stress if this happens. Now I have two ovens so this is easy to make, one tin per oven, but if like most people you only have one oven, after one hour of baking switched the tins to ensure even baking. 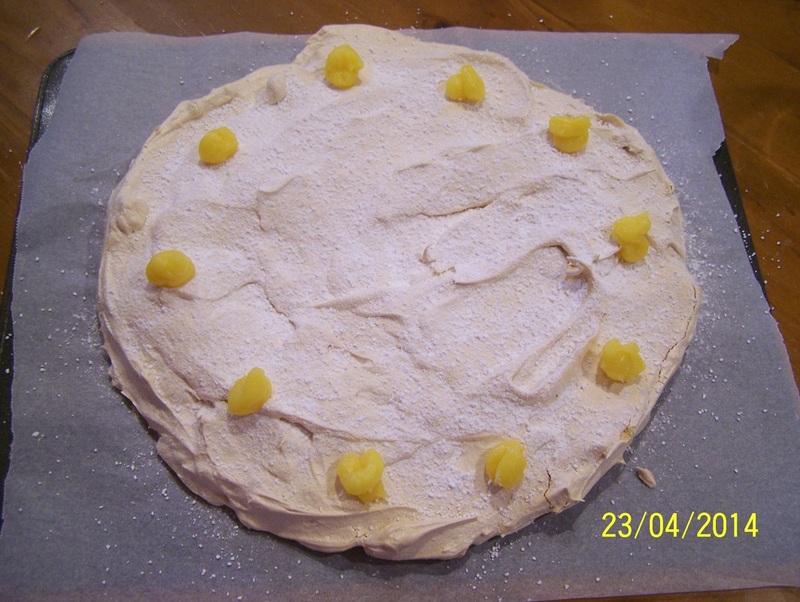 The original recipe used one springform tin and one baking tray lined with a 23cm baking paper circle to bake the meringues, but as the one on the tray expanded after cooking, I think to get the circles of meringue the same size 2 springform tins would give a better result. Since making this originally, I now always make it in two springform tins. Perfect results every time. Do not make this if you have no room in the freezer, it will not set right in the refrigerator, it will fall apart when slicing if you try, learnt that the hard way. It really does need the freezer to set it. The orange jelly will set on cooling, if it is hard to work with before you have spread it, just add a teaspoon of water to the mixture and stir it in, keep adding the water until it is of spreadable consistency. And do not put hot jelly over the meringue, it will ruin the meringue. Also I ran out of time to decorate it with some spun sugar, but I will add it to recipe, it makes it look great. For the meringue: Preheat the oven to 140C. Grease 2 x 23-24cm springform cake tins and line the base and sides with baking paper. In a large bowl of a freestanding mixer, whisk the egg whites, salt and cream of tartar until soft peaks begin. Whisk in the sugar slowly, a tablespoon at a time, until the mixture is thick and glossy, then add the vanilla. Divide the mixture evenly between the two tins, level out the tops. Bake for 2 hours, until crisp. Switch off the oven and leave to cool, with the door open. 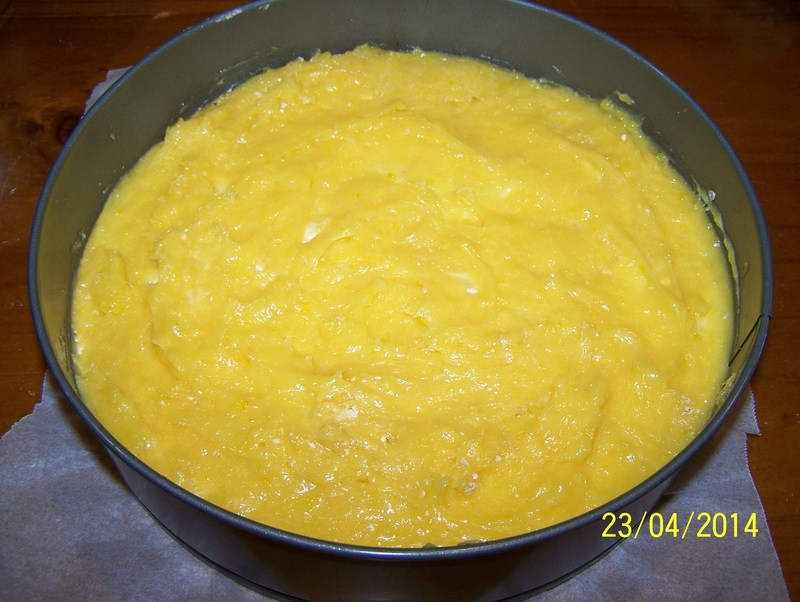 For the Orange Filling: In a large bowl add the sugar, cornflour and salt, whisk gently to combine. Add the zest, orange and lemon juices and the yolks. Whisk into the sugar mixture well, ensuring no lumps. Pour the mixture into a medium sized saucepan and heat gently to a boil, whisking continuously. Once it comes to the boil, whisk for 2 minutes, then leave to cool, whisking occasionally. (If your mixture seems too thick, add a teaspoon of boiling water to the mixture and whisk in until you are happy with the consistency. Mine was, so I added up to 1 tablespoon of water extra, as you need it to be thick, but spreadable). Spread 3/4 of the filling on one of the meringue discs, leaving only enough orange filling in the saucepan to decorate the other meringue with dots of orange filling. Pipe dots of orange filling onto the top meringue. If you have any leftover filling, spread it on the other disc, don't waste it. 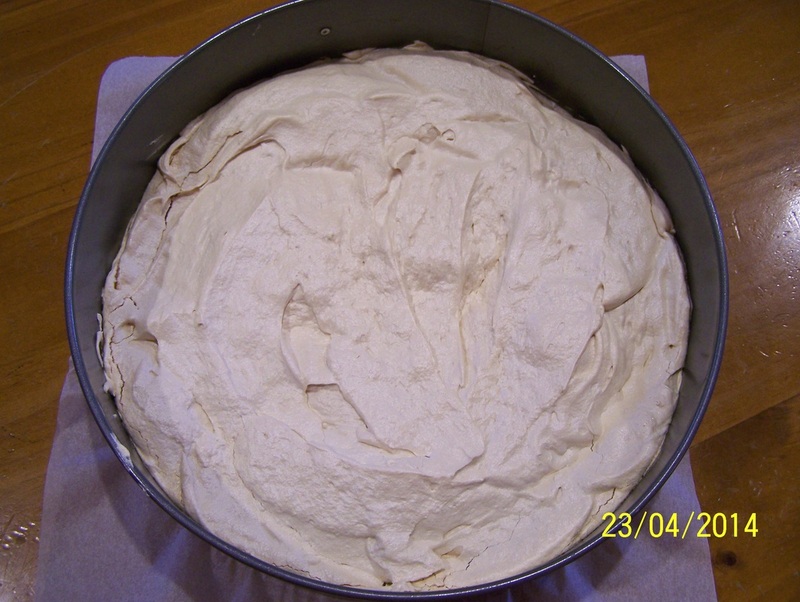 The original recipe uses 1 cake tin and 1 baking tray to bake the meringues. The tray meringue expands and doesn't make a perfect circle, so I suggest buying a second tin, this way the end result is perfect. I also now use a piping bag and tube to make the orange dots. For the Raspberry Mousse: Puree the raspberries and sugar, then press through a sieve into a saucepan. Bring to the boil, then simmer, stirring occasionally until reduced by a third, it takes about 5 minutes. Meanwhile, sprinkle the gelatine over a small bowl with the water in it, stand for 5 minutes. Place the bowl with the gelatine over a pan of simmering water and stir until the gelatine has melted. Stir the gelatine into the raspberry mixture. Pour into a large bowl. Chill for 20-30 minutes, stirring occasionally. Once the raspberries have cooled, fold the cream into the raspberries, I used a whisk to do this. Pour the raspberry mixture over the orange filling. Cover with aluminium foil and freeze for 1 hour. 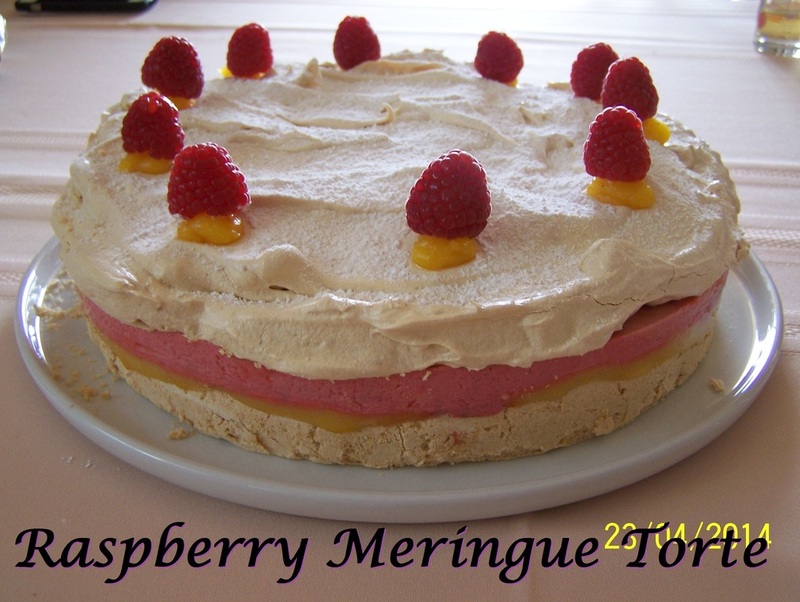 After 1 hour carefully place on the top meringue, pressing down gently and continue freezing for a further 3 hours. Carefully transfer the torte onto a serving plate. Sift with icing sugar. Top the orange circles with a raspberry. Melt the sugar over a medium heat until deep golden. Do not stir. Remove from the heat and use a fork to flick back and forth over the back of a teaspoon. Set aside to cool and set, then carefully twist off of the spoon. Repeat with the remaining melted sugar and place on the torte, on top of each raspberry. This one I used a cake tin for the base but used a baking tray lined with baking paper with a circle drawn on it. Still tastes the same, just not as perfect looking.